Customers frequently asked what rake might work best for them. They often refer to "the FBI rake". I have never read or heard anything that would indicate the FBI specified a particular degree of rake for their issued holsters over the years. "The FBI rake" is simply a shorthand version of saying "muzzle rear rake". The degree of "the FBI rake" is open to the interpretation of each holstermaker. Slide a manila folder or similarly heavy paper about halfway down inside your waistband in the area where you will wear the handgun. Position the handgun under your waistband and over the folder with a rake of your choosing. 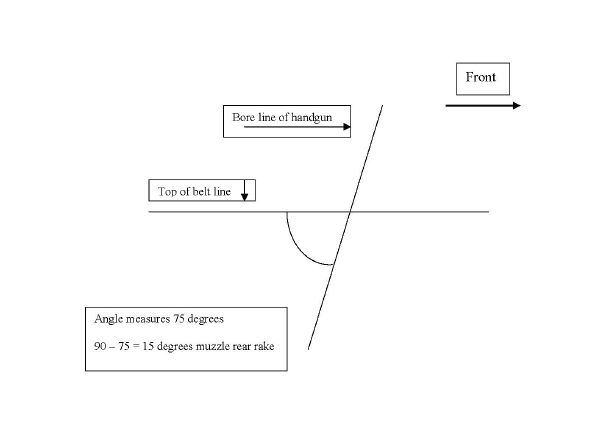 Stand straight and still while your partner uses a pencil to mark the folder by tracing a line along the top of your waistband both in front of and behind the gun and along the top of the slide (the area between the front and rear sights) from just below the rear sight down to the waistband. Remove the pistol and the folder from your waistband. Using a straight edge, connect the horizontal lines (they probably won't be in perfect alignment so try to average them to create the straight line). Then extend the third "vertical" line so that it intersects the horizontal line. Use a protractor to measure the smaller of the two angles either above or below the horizontal lines. Then subtract that number from 90. The answer will be the angle of carry. Many customers assume that their waist size for pants is the same as their belt measurement. This isn't usually the case. In order to make sure that you get a belt that fits you, please measure a belt you currently wear. If you already have a heavy belt, and are going to be wearing the same type of holster on your new belt as the old one, it's just a straight measurement. If, on the other hand, you currently wear a thin dress belt and don't wear a holster on it you'll probably want to add an inch or two (depending on your pistol) to the length. Measure from where the leather bends around the base of the buckle down the belt to the hole you use. Add length to that figure if the last part of the above paragraph applies. Whatever length you decide on will become the middle hole of five on your new belt.